Review Summary: A kaleidoscope of an album, "Everything Not Saved" combines everything we've come to love about Foals with some brand new flavours: creating their boldest, best sounding offering to date. Bands change; most people familiar with the industry or music as a whole know this especially in recent years. Bring Me the Horizon changed, Arctic Monkeys changed, Hella changed and then changed back. In our modern era, it is more common for a band to completely switch up its sound from album-to-album than say the 60s or 70s. 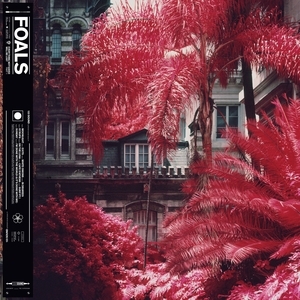 Taking a look at Foals' new record, and putting it up next to maybe "Total Life Forever", it's definitely the same band... but something has changed. Much like the aforementioned Arctics, holding "Tranquillity Base" up to their debut effort, it's definitely the same band... but something changed. Maybe the production is different, or the instrumentation is different - or Alex Turner has gone from howling about nights out with the lads to crooning about a hotel in space. For Yannis Philippakis, the nights out were "Antidotes", and the space hotel is almost certainly "Everything Not Saved Will Be Lost, Part 1". From the very start, the swirling electronics say a lot about what is about to go down. In fact there are heaps of electronic influences on this album. Perhaps due to the departure of co-founding bassist, Walter Gervers, with the band opting to use very synth-heavy backings for their sweeping low-end frequencies most eloquently displayed on "Moonlight" and lead single "Exits". For die-hard fans of Foals, Walter's announcement was more than likely met with scepticism which is understandable. Chemistry is key to a band's success, and losing a member of the family is going to make for an awkward environment in the rest of the house. Look at Carlos D. and Interpol, for example. However, I don't think this new record meets the same fate as 2018's "Marauder", which took the same missteps as Interpol's self-titled album and ultimately faded into mediocrity. Foals, despite the loss of their bassist, pull together what may be their best offering yet both in musicianship and scope, notwithstanding it's short running time. What perhaps pops out at first is the production: self - produced, in fact. As a result, the album harkens back to the frenetic days of "Antidotes". The drums are fore-fronted, and the newly-added synth bass is heavily centred. As a result of the mix choices, the early stretch of the record is very dance-pop infused, territory Foals have stepped into before but not quite fully explored. Songs like "In Degrees" and "White Onions" are a perfect example of just how talented the guys are at blending genres together while still staying to their own innovative sound. It is honestly remarkable. Self - production is dangerous territory sometimes, though Foals have fully trespassed into it and come out with a brilliant album. Speaking of sounds, the band has never sounded more brilliant playing alongside one-another. "Exits" and "Syrups" see all the elements of each respective track flawlessly complimenting each other. The bass is punchy, the drums are groovy, and the vocals haven't been this great since their 2nd or 3rd album. The diversity and creativity on show here is astounding. From the soulful-ballad gone experimental dance number "Sunday" to the glitchy In Rainbows / King of Limbs-esque "Cafe D'Athens", the album is like a showcase of everything this band are capable of, creating a mix of their best work yet. The twinkling guitar techniques and keyboard riffs are the cherry on the top of the tightly wound rhythm section, making every track a joy to listen to. Really, this joy only falls through in "On the Luna". Sounding like a mix between the distortion of "What Went Down" and the vocal patterns of "Holy Fire", it is possibly the most uninspired-sounding song on the record, braking the flow between the far superior "Syrups" and "Cafe". However, it is a mere speed bump on an already fast paced record, and within the album's context is actually okay. When everything is glued together bumps like that are rarely a bother because by the time "I'm Done With the World" hits, you're so far taken aback its hard to realise this collection had any out-of-place songs in it anyways. This is truly a kaleidoscope of an album, and the colours seen within are all vibrant, dynamic, and just damn pleasant to listen to. Facing the red-hot issues of our era via masterful lyricism, all while channelling beautifully written, angular riffs, Foals have come through with their best work since the inception of their band. While the change may not be for everyone, I fully believe once you embrace the slightly-altered approach of Yannis and co., the result will amaze you. "Everything Not Saved Will Be Lost" is a superb album, and after some time away, Foals have returned to the lime-light with a picture-perfect soundtrack to a world that is upside down. "the album is like a showcase of everything this band are capable of - creating a mix of their best work yet." The dash is meant to be an interruption of thought, but here it's a logical continuation of the sentence. Should be a comma. A few awkward phrases here and there as well, most of which are easy to pick on a quick read-through. Some little stuff i.e. "there is heaps" (should be 'are' instead) mixed in with odd stuff i.e. that (in my opinion) addition in the second paragraph. Reviews contain objective elements, certainly, but it ultimately amounts to your subjective opinion--the reader is aware this is YOUR voice, not necessarily theirs. thanks, I re-read it a couple times and realised how horrible the punctuation placements are. I'm never usually that bad with it so maybe I'm just tired lol. I also tweaked some of the weirder turns of phrase and got rid of the in my opinion bit. Not entirely why I wrote that, probably needed to proof read this a few more times before submitting. Time I gave this band a listen. @sepia any time my man, glad I could help out. Agreed, their weakest but still lots to enjoy as the review pointed out. Really good read overall, and convinced me that this is a little better than I initially thought. The bass lines in particular, like in Syraps, are one of my favorite aspects of it. Not feeling this tbh. Production and musicianship are great but... too many repetitive patterns, too many OooooOoooo's, too many stretched parts, not enough inspired melodies. Plus it feels very short (39 min). Still a nice album, and they definitely needed a "new" direction, but if it comes to fun, I'd take Antidotes over this any day. I've only heard Holy Fire but I felt like this was a notch below that album. Still good, but nothing I'll probably remember by the end of the year. 'Syrups' is the best cut here. I love antidotes but there's just something about this album I love so much. Length doesn't bother me too much, some of my favourite records like Maps and Atlases' Tree, Swallow, Houses and Hail the Sun's Mental Knife are between 25-40mins. I like the repetitive patterns because they get really well built on, like in Cafe D'Athens with all the different glockenspiel parts. This is probably my favourite Foals album tbh. I’ve always wanted to get into this band after being impressed by a few songs, but their vocalist has irked me in the past. This seems pretty great so far though. It could just be the production I’m impressed by, but this could be the album that makes me a fan. Sunday, On The Luna and White Onions are 3 absolute bangers. For me, this is tied with Antidotes as their best record. Several aspects from here reminded me of that album. I mean, White Onions, In Degrees, Syrups, On The Luna, Cafe D'Athens and Sunday are all top notch Foals songs. I'm Done With the World is beautiful and poignant, Exits is a very good first single (A bit weaker than the rest of the songs tho) and Moonlight is a nice little intro. Really enjoyed this. There's plenty to like for fans of Antidotes in here, way more than in any other Foals' album. Hopefully you'll enjoy this one, Pots.